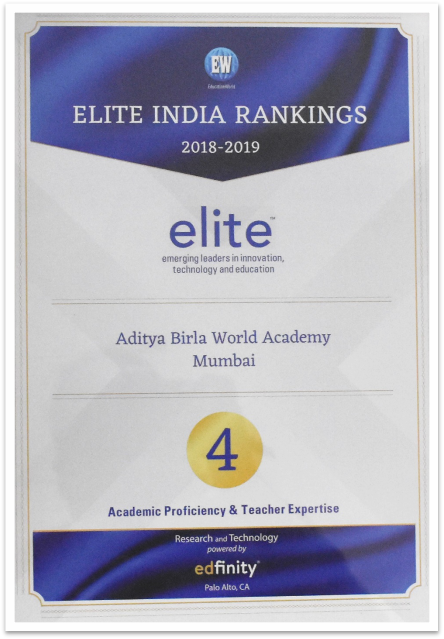 Aditya Birla World Academy has been ranked 4th amongst all schools across India in Education World’s ELITE (Emerging Leaders in Innovation, Technology & Education) India School Rankings 2018 in Academic Proficiency & Teacher Expertise! The ELITE Rankings survey has been created & powered by Edfinity, a National Science Foundation-funded organisation, headquartered in USA. The Edfinity team comprises of successful entrepreneurs and educators with affiliations to top-ranked US colleges and universities. We are also delighted to inform you that ABWA has been ranked 1st in South Mumbai & 2nd in Mumbai in the category of International Curriculum.